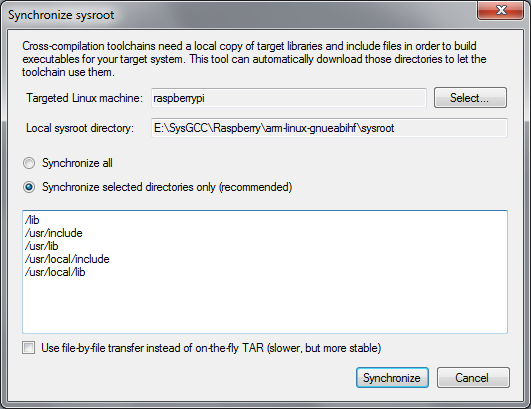 This tutorial shows how to update your sysroot directory for the Raspberry PI cross-toolchain. It is highly recommended to update the sysroot after downloading the toolchain, or after switching to a new SD card image. The sysroot synchronization ensures that the versions of headers and libraries used by the cross-compiler match the versions of the files located on your Raspberry PI board. Ensure you have downloaded and installed the cross-compilation toolchain. Click on the "select" button. In the "New SSH Connection" dialog specify the host name of your Raspberry PI board and the login/password. Note that default login is "pi" and the default password is "raspberry". Once the synchronization is complete, you can start using your cross-toolchain. Remember to re-synchronize sysroot after installing new libraries on your device or after changing the used image.